shattered! | eating with S.O.L.E. I dropped a tiny little vase on my new slide in kitchen aid convection oven that I have been enjoying and loving for a wee 6 months. TRAGEDY! It just so happened to break the night before I served a meal for 12… no big deal right? Currently I am feeding 8 two time a day, with no stove. I took one giant step back in my kitchen cook-ability, back to the fire pit.. which is ok I did that for months when we first arrived here, but still it’s heart breaking. Good thing we just got the cob oven fired up and are trying to figure out how to cook well in it. I have the old BBQ and my faithful Instapot, and one day soon and a zillion dollars later the cooktop will be replaced. 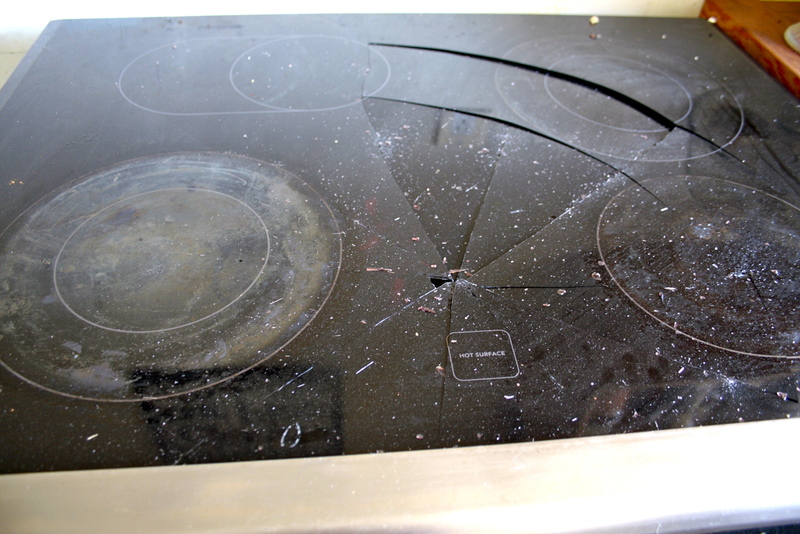 Is this crazy or what, the salesman told me when I was shopping for the perfect convection oven, that I would have no issues with the ceramic cooktop, and that even though I only cook with CAST IRON, a point I stressed!, I should have no fears about breaking the cooktop. Geez the vase I dropped weight about 100 grams… I think my cast iron wok weighs about 15 lbs! 😦 Man they just are not made to be durable!!! What a sham and a shame. I would have gone gas if we could have managed a propane cylinder… one day.